Franki is our girl when it comes to using up pieces of leftover fabric! Pattern cutter extraordinaire, I’ve asked her to come up with ways that we can make the most of our sad left over lengths of fabrics- so we have no excuses not to waste anything! Hopefully you’ve already had a go with her brilliant kimono and collar and bow-tie patterns (seriously- what an amazing present for someone out of lonely leftovers!) Here, she shows us how to make an over-sized, drapey tee – just up my street! When it comes to designing clothing that is zero waste, there are some fabulous designers out there. Have a look at these patterns by Holly McQuillian and Timo Rissanen. Last time, we created a zero waste kimono. 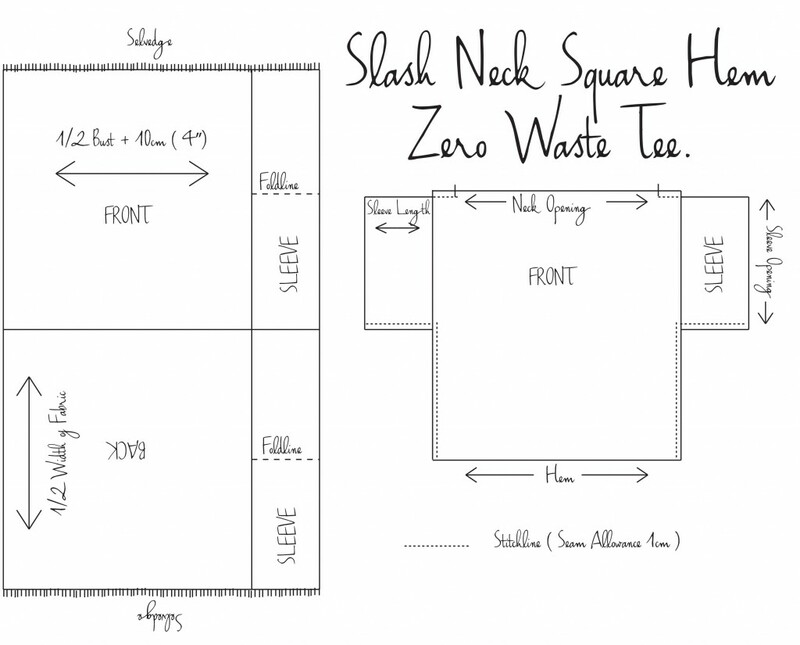 This time, we’re exploring the zero waste t-shirt pattern as suitable for beginners, using the Kimono as inspiration. Now, although I have put this pattern together, like the kimono, I’m certainly not claiming this as my zero waste t-shirt design! I’m sure a garment like this must have been created thousands of times before. It is a flexible starting point and extremely easy to adapt- so be brave and play around with it a bit! The style of this zero waste t-shirt/top is loose fitting, and on me it pretty much hits the high hip in length. 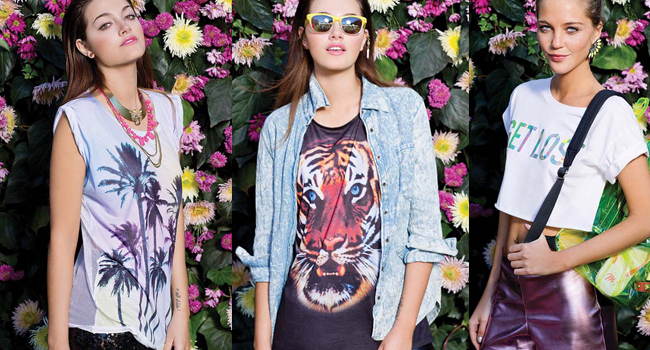 All you need is some fabric & a bit of thread. For a size 10/12 (bust = 90cm) I started with 70cm (28”) length of fabric that was 115cm wide. I’d recommend a georgette, soft viscose, bamboo or a jersey (basically fabrics that drape). 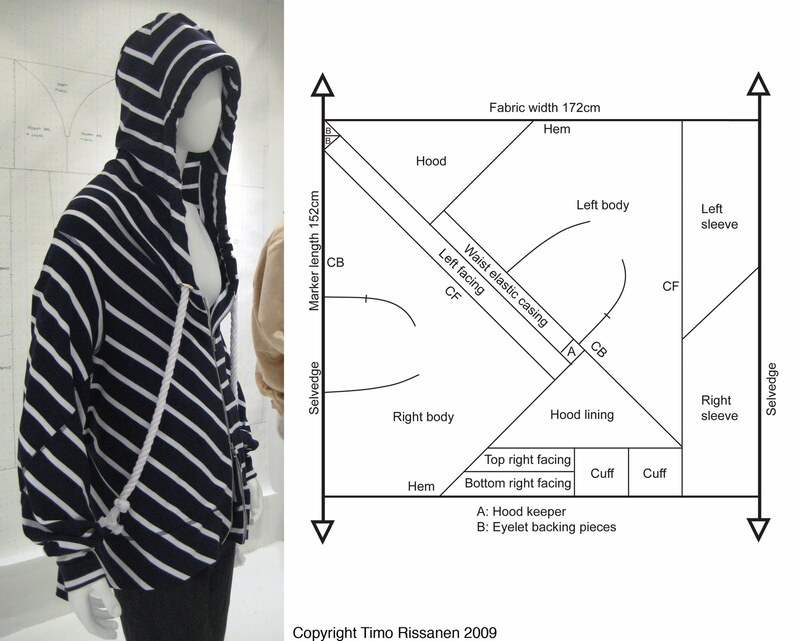 This garment is designed around the fabric – the length of the top will be dictated by the fabric width. This is the width of your front and back pieces. The rest will become sleeves. 2. Measuring selvedge to selvedge, cut your fabric at this measurement. And cut this larger piece in half down the length. You should have two pieces that are the width of 1/2 your bust measurement. 3. Cut your left over piece (this will form two sleeves) exactly in half as well (see diagram). 4. Having your four rectangles cut out, I found this was a good time to overlock, if you don’t have an overlocker you could finish the edges with pinking shears. Finish the raw edges around each piece before sewing anything together. 5. Stitch the large rectangles together (right sides together) along the top edge (the shoulder seam). *SEAM ALLOWANCE: You can use whatever seam allowance you prefer, it will have minimal effect as the style as it is loose. Sew 8cm in from the outside edge. Do the same on the opposite side, this is the shoulder seam and the space in between is for your head. Press the seam open. 6. Attach the sleeves: Fold each sleeve piece in half and make a snip at this central point (only a little way in) – this matches to your shoulder seam. Using this ‘notch’ as a guide, stitch the sleeves to the body of the top, right sides together. Press the seam towards to the sleeve. 7. With the right sides together, stitch the underarm and the side seam in one line (just how the pros do it! ): Starting at the sleeve end (leave the hole open for your arm!) stitch the lower sleeve seam. When you get 1 cm into the body of the top, turn at a right angle (90 degrees) towards the hem, and continue stitching the side seam. Snip into the hem into this right angle (don’t nip the seam). Press seams open and turn the right way round. 8. Now all you need to do is finish the Hem, Sleeve Openings and Neck Opening. Simply turn your seam allowance width, towards the wrong side of the fabric, stitch down the centre of this turning to hold. 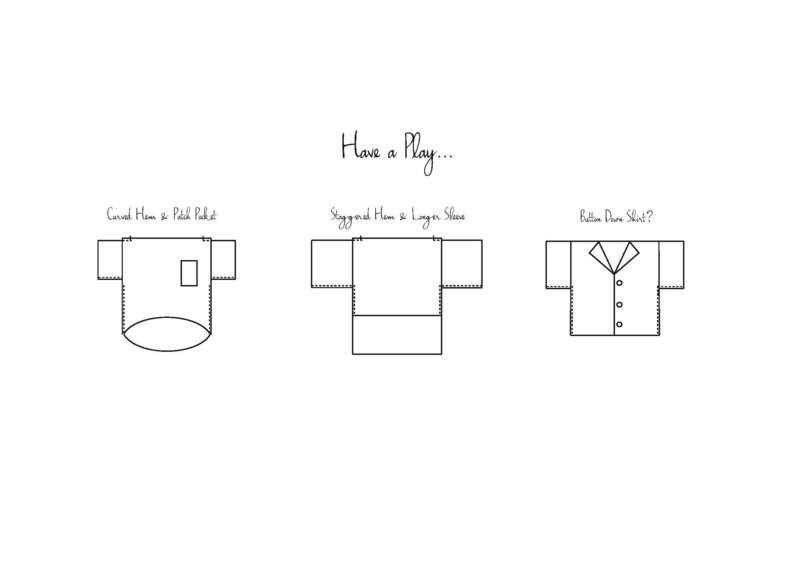 Play with the sleeve length. If your fabric is wider, your top will be longer – what about some ties to make it more shapely. If you want the armhole to be shorter what could you do with the left over? How about a patch pocket?